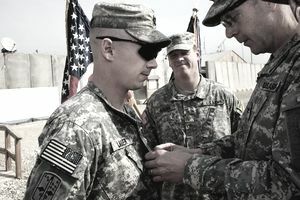 As long as you are not neglecting your duties and have not been in serious trouble, an enlisted person with more than six years of service and less than 20 years of service (retirement eligible) who is involuntarily separated (under honorable conditions) is entitled to receive involuntary separation pay (severance pay). In short (for example), if an Air Force E-4 does not get promoted to E-5 by the time he/she has 8 years of military service, the member will be forced to separate. These rules are strictly enforced especially during times of downsizing and force reduction. These guidelines apply to active personnel and members of the Reserves. Like the Air Force, these apply to active duty and Reserves members. The Army has also changed the maximum age an enlisted member can remain on active duty from 55 years to 62 years. An E-5 who has been passed over twice for promotion to E-6 may be separated at the end of their current enlistment, even if they have less than 13 years of service. An E-6 who has been passed over twice for promotion to E-7 may be separated at the end of their current enlistment, even if they have less than 20 years of service. An E-7 or E-8 may exceed 20 years of service only if they have not been passed over twice for promotion. E-3/E-4 - 10 years active Coast Guard service or 10 years active military service, whichever is greater. As with just about every standard and rule in the military, there are waivers available for a person seeking to fight the high year tenure workforce management rules and standards. A member seeking to submit a waiver should do so within 10 months of his/her HYT date and have a justifiable reason why that person should be kept in the military. Usually, under-manning of your skill and experiences is good enough reason or the service member will be deployed at the time of your high year tenure date. Obviously, a waiver will need the immediate chain of command support and letters of recommendation. What Are the United States Military Body Fat Standards?